Local group fights to prevent proposed coal mine from opening in Fanny Bay. Sue Medley has come home. And what a journey it’s been for this Nanaimo-born singer-songwriter. She left the Comox Valley at just 17, viagra dosage soon after graduating from Vanier High School, there following the call of her heart and the strength of her talent. Her first stop was Vancouver, where she sang with a top-40 cover band, paying some serious dues before moving on down a road that had her touring around the world, releasing hit singles, and winning a bunch of prestigious awards. “People haven’t heard the last of me—the best is yet to come,” says Sue Medley, at home in Comox. 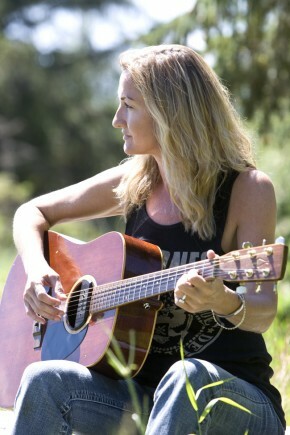 Known for her rich, soaring voice, accomplished guitar playing and natural gift of song-writing, Medley resists tidy classification in a single musical category. Although she’s sometimes been called a country singer, she sees herself in a broader light. “Instead of defining what I do by a name of a genre, I’d rather say something like… well, let’s say if you take a bit of Melissa Etheridge, a touch of Sheryl Crow and throw in a handful of Bonnie Raitt, you’d get me,” she says, laughing. “Just put it all in a blender, mix it up, pour it out and shoot it back!” she adds, sounding like the lyric-writer she is. The lowest point came about 10 years ago in Los Angeles. She’d moved there in 1998, after signing on with a new manager who was based there. Things started out promisingly; Medley released an independent CD, her third, called Velvet Morning, and shot a video, but without the promotional power of a major record company (in a time before Facebook, Twitter, and YouTube), it had met only a modest response. The 15-year long whirlwind of touring, recording, and performing had lost its momentum, leaving her somewhere she’d never been—among the crowded ranks of underemployed musicians. “For the first time ever, there were no venues, no record deals, no tours, no money,” she says. Medley says she went through “quite a few” dark nights of the soul during this period—but she doesn’t regret a thing. The tough times pushed her inexorably toward transformation, and she emerged from the dark with a new way to use her talent, and a realization that it was time to go home. “I did a lot of soul searching and reassessing of what was important to me, and realized that what I wanted most was family and community. “I’d been based in the States 19 years—in Nashville, in Bloomington, Illinois, and in LA. But my family was here—my parents and both my sisters. After those many years, I’m now living within walking distance of all of them,” says Medley. I get her point. Although Medley says her move was tough, she seems to have landed on her feet—in paradise tucked away in Comox. Just a few hundred metres off Comox Avenue, just past the Filberg Park, is a secret driveway that winds down toward the ocean. At the end there is a property that feels distinctly rural with sun-dappled meadows, aged fruit trees, grazing fawns, and a handful of charming little seaside cottages. Known as the old Stubbs farm, this acreage has recently been bought by the Town of Comox to be preserved and eventually made into a park. One of these cottages is Medley’s home base, where she has not only been connecting to her roots but also spreading her branches—in particular, launching her teaching business, Kids Rock. During her tough times in Los Angeles, Medley’s passion for music stayed as strong as ever, even as the performance opportunities and record deals were dwindling. Luckily she was able to find a new outlet. “Just when I was at the point where I was asking myself, ‘Now what am I going to do?’ a friend suggested teaching. At first I thought, ‘Who, me?’ but I got one student by word of mouth, then two, then more and more, all by word of mouth, until pretty quickly I had 17 kids,” she says. Because Medley knows just how exciting performance is, she makes sure her students experience the challenge and thrill of playing live on stage as part of a band. “I organize recitals, with me on guitar and a professional bass player, so the kids get first-hand experience, and the parents get to see how much their kids have learned. “It’s a blast. At the end we bring everyone up—imagine 17 kids aged eight to 16, all with their electric guitars plugged in playing a rock classic, something like Bachman Turner Overdrive’s Taking Care of Business. Medley has no problem relating to the kids—after all, she herself started out as a music-crazy pre-teen. “Music was always my calling,” she says. She started out with a drum kit at age 11. 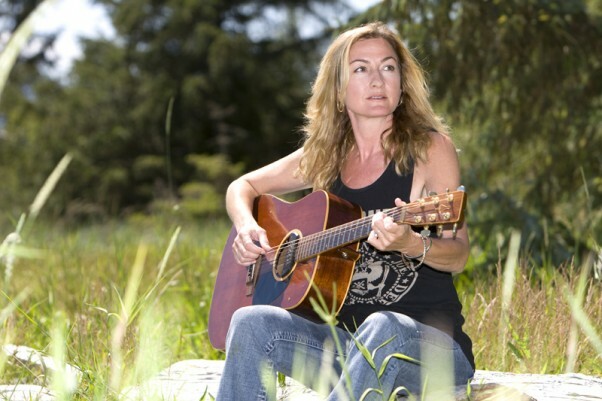 In Grade 7, while attending Courtenay Junior School, she took up guitar. When she was 16, she joined the Comox band Punch. “That was a great way to start out, because the other band members were 10 years older and really great musicians—they still are; they still live here. It was a really great catalyst for me,” says Medley. “Once I graduated from high school, there was no question for me of what to do next. It was full tilt music. I played in a few different versions of Punch around the Island, then moved to Vancouver and ended up singing in a top-40 cover band, Renegade. It was in that period that Medley started writing her own songs. “It happened pretty simply. One day I just thought to myself, ‘I’m tired of singing other people’s stuff.’ So I sat down with my guitar and started writing,” she says. The single garnered her five West Coast Music Awards, including best vocalist of the year and best country vocalist of the year. It was followed by Angel Tonight a couple years later. By then she had made an appearance at the Big Valley Jamboree in Saskatchewan and on television on the Tommy Hunter Show. This “history” comprised a busy and varied musical career. There was a self-titled debut CD in 1990, co-produced by Medley and John Mellencamp producer Michael Wanchic, which yielded two successful singles, the number one hit Maybe the Next Time and Dangerous Times, and was followed by a North American tour, including dates with Bob Dylan. She also became national spokesperson for Ride For Sight, a charity to raise funds for the blind, and co-wrote the charity’s theme song, Born To Ride, along with Bryan Adams writer Jim Valance. Medley’s second CD, Inside Out, was released in 1992 and was followed by a support tour with the likes of Tom Cochrane and 54.40. The single When The Stars Fall became a hit on album radio and reached #2 on music industry magazine The Record’s chart (being locked out of #1 only by U2). And on it went—more tours, another single, a video, placing songs on the TV show Dawson’s Creek, more awards, including several SOCAN (the Society of Composers, Authors and Music Publishers of Canada) awards and Junos for Most Promising Vocalist and Album Art, playing at Farm Aid in Louisville, Kentucky, on the Tonight Show with Jay Leno backing up John Mellencamp, and at the Junos. She lived in Nashville, then Bloomington, Indiana. The move to LA happened in part because of a relationship that broke up. “It was one of those things… he was a musician,” she says, with a rueful, memory laden laugh, adding, this time with a more cheerful laugh, that breakups provide the best songwriting material. But a couple of years later, the wonderful ride had slowed right down. “It was scary and downright depressing,” she says. “Music was all I’d done since I was 15. Imagine what it’s like when everything you’ve known and done you can’t do anymore. Difficult though this period was Medley knew she had a deep well of inner strength to connect to. “I’m a survivor; I’ve overcome a lot of obstacles. There’s something in me that doesn’t give up. No matter how hard it is, no matter how painful life gets, I don’t give up. Because I know that somehow it’s going to be okay in the end,” she says. The “okay” part of this time began when she started teaching, and culminated with her return to her roots. Going through this challenging transition has also deepened her playing, singing and song writing, she says. And once she got home, she faced a big shock: for the first time in her life (she’s in her mid-40s) she had to get a day job. Medley worked in catering for a while and then as administrative assistant at the Filberg Lodge. “Those were such learning curves,” she says. Lately, Medley has felt settled enough to put more energy into Kids Rock. She’s already got a handful of students and recently put up a website. She finds that in the Comox Valley, as in LA, word of mouth is a powerful marketing tool, and looks forward to a growing roster of students. However, although Medley did become something new—a music teacher—she never stopped being what she always was—a musician. Last December she did a three-week cross-Canada Tour, her first in a long time, as part of show called Canadian Country Christmas. This July she attended and performed at the Vancouver Island Music Conference and then sang a few songs on the big stage at MusicFest. She’s been writing new music and has plans to release a new CD sometime this year. She won’t say much about the new material except that it will be more acoustic than most of her previous work, and that the songs reflect the transformation she’s been through. And that some of what might be the strongest work on it reflects a recent break-up. Her new work also reflects her joy at being home. Soon after returning she wrote a song called My Town about the Comox Valley. The video, accessible on YouTube, produced by local company Blue Bamboo, shows beautiful image after beautiful image of the area—eagles soaring over the tree tops, the moon rising over the mountains, the sun setting behind the ocean, children dancing at a festival, snowboarders on the mountain and more. The song and video speak eloquently: clearly, Sue Medley has come home, and is thrilled about it. For more information about Sue Medley and the Kids Rock program, go to www.suemedley.ca. All that changed last October when he attended a community meeting to learn more about a proposed coal mine in his neighborhood. One of the first things he discovered was that this is a big project: Compliance Energy Corporation, a Vancouver-based company working in partnership with Korean and Japanese investors, is proposing to dig more than 2,200,000 tonnes of coal a year for the next 20 years out of an underground mine in a valley overlooking Fanny Bay. The mine will cover 200 hectares on the surface and 3,100 hectares underground, and will operate 24 hours a day. The coal will likely be shipped by truck to Port Alberni and then by ship to China, where it will be used in steel production. Snyder was concerned about his well, which had almost run dry the previous summer. Might a coal mine make this worse? Indeed, it might, he learned at the meeting. And there were a whole lot of other things a coal mine just might do. None sounded good to Snyder. 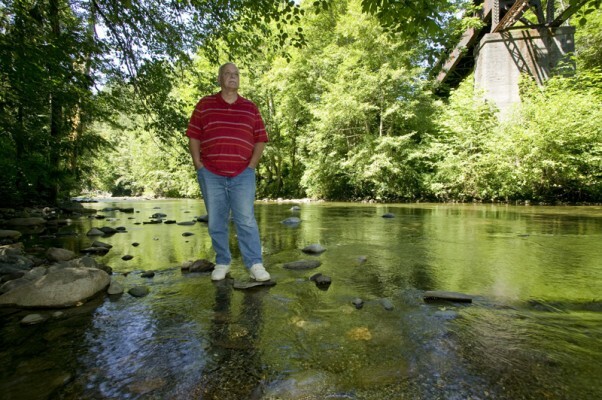 Never mind his well—now Snyder was worried about air pollution from toxic coal dust, which can cause or exacerbate health problems ranging from black lung disease to asthma; noise pollution; water pollution that could poison salmon-bearing streams, groundwater, and the ocean waters of Baynes Sound; increased highway traffic; adverse impacts on the local shellfish industry; decreased property values; dangers associated with methane gas in the mine; and something nasty called acid mine drainage (ADM), a type of long-term toxic leakage that can continue long after a mine has closed down, necessitating long-term, expensive remediation efforts. Not to mention the mine’s contribution to global warming. Today, Snyder is Chair of CoalWatch, the Fanny Bay-based community organization that formed to oppose the coal mine after the October meeting. Part of his job includes talking with the media, which is why he’s sitting with me on a picnic table at the Buckley Bay ferry terminal on a July afternoon, answering questions and enjoying the sunny skies, sparkling ocean and cheerful hubbub of ferry passengers. With a steering committee of 14 who meet regularly at each others’ homes or in the Fanny Bay Community Hall, CoalWatch is as grassroots as you can get. “It seems that most of us who are really involved live on Tozer Road,” says Snyder with a laugh. He gestures with his head toward Ship’s Point, a peninsula snaking off of Vancouver Island just to the south of where we’re sitting, which houses Tozer Road, a bucolic country lane that dead-ends in a stand of Douglas Firs. “That’s the hotbed over there,” he adds, grinning. CoalWatch may be markedly local, but it has a mailing list of 350-400 concerned citizens, not just from Fanny Bay. “If people think this is just the problem of little Fanny Bay, I’m sorry to say they are mistaken,” says Snyder. Although the Raven project is still in the planning stages, many individuals and organizations are voicing their opposition, or at the least, watching the situation closely. The BC Shellfish Growers Association (BCSGA) passed a resolution opposing the mine, on the grounds that heavy metals and other toxic runoff could compromise this thriving local industry, which depends on clean waters. Baynes Sound (the waters between Vancouver Island and Denman Island) houses 51 per cent of BC’s annual shellfish harvest. The local shellfishery is valued at $17 million annually and employs more than 500 people in jobs that will be around long after the miners pack up and leave, says Roberta Stevenson, BCSGA President. Neighboring Denman Island, whose western shore is just 6.2 kilometres from the proposed mine, has launched a barrage of opposition from its governing body, the Local Trust Committee, its Residents’ Association, Marine Stewardship Committee, and United Church, and has spawned its own citizens’ group, Denman Island Opposes Coal (DOC), which is working diligently to stop the mine. Many governing bodies in the region, including the Rural Directors of the Comox Valley Regional District, the Courtenay Council, the Town of Qualicum Beach, the Village of Cumberland, Comox Town Council and The Islands Trust Council have formally expressed concerns, calling for more detailed studies and assessment or simply opposing the project outright. Environmental groups such as the Wilderness Committee, Sierra Club BC, and Comox Valley Conservation Strategies Planning Association (a consortium of eight organizations) have been speaking out against the mine. In June, a group of activists demonstrated outside Compliance offices during the company’s board meeting, protesting the proposed Raven mine. Concern from outside the region tends to focus on the implications of opening a new coal mine—the first in almost 25 years—on Vancouver Island, at a time when reliance on fossil fuels looks increasingly short-sighted. “This campaign is not just about one coal mine in the Comox Valley,” says Tria Donaldson, Pacific campaign coordinator for the Wilderness Committee. “At the heart of our concern is the pure hypocrisy of expanding our fossil fuel industry while claiming to be climate leaders. “The government of BC has set lofty goals of reducing our provincial emissions by 33 per cent below 2007 levels by 2020. The massive planned expansion of coal mines like Raven Coal undoes any work done on the climate front. If we don’t want to burn coal in Canada because of climate change, how is shipping it off to China to get burned any better?” she adds. Although most of the coal from the Raven Mine would probably not be used as fuel, virtually all its carbon dioxide, the culprit in global warming, is still released into the atmosphere during the steel-making process. As well, the transportation of the coal—an estimated 98 trucks coming, and 98 going, per day (that’s one leaving every 15 minutes) plus 20 ships coming in and out of Port Alberni—leaves its own considerable carbon footprint. Beyond the local issues, this is a debate about the direction of BC’s economy and its approach to sustainable resource management. “I wouldn’t be putting so much time into this if I hadn’t realized that this goes a lot further than my own backyard,” says Snyder, who estimates that he spends 20 to 30 hours a week on CoalWatch business. British Columbia is North America’s biggest coal exporter, and critics say it is time to change course. “Maybe it’s time to look at saying no new coal mines, period,” says Snyder. Denman Islander Patti Willis saw the big picture right away. A founding member of Denman Island Opposes Coal, Willis has a background that puts her in sharp contrast to John Snyder—she’s a veteran activist with more than 35 years experience engaging in, and often running, peace, forest protection, anti-mining, conservation, and other social justice and environmental campaigns, both locally and internationally. Early this August she was honored with a Stewardship Award from the Islands Trust in recognition of her many years of community service. Willis says the Raven Coal Mine represents the biggest environmental threat Denman Island has seen in at least half a century, and Islanders are clearly very concerned. DOC has about 20 active members and a mailing list of 100; at a June community meeting, close to 200 people showed up, packing the hall, and not a single speaker supported the mine. While opposition to the mine may seem deafening, especially from the “hotbeds” of resistance on Tozer Road and Denman Island, Compliance Coal Corporation remains confident that the concerns are either unfounded or can be dealt with. “Our job is to be able to answer the questions that those people are posing. From the very beginning we’ve been committed to being transparent throughout the process and to developing this in a socially and environmentally responsible manner,” says Compliance CEO and President John Tapics in a phone interview. “It’s very early in the process and we’ve been completing a number of studies that cover a broad spectrum of areas; all of those studies and information will be available to the public,” says Tapics. Employment is definitely the big draw for those who support the proposed mine. “The coal mine will create real jobs for people with families that will buy houses and help refill our schools… this will encourage our younger residents to stay here instead of moving to Alberta where the money is,” writes Kim Morton in a letter to the Qualicum publication, The Beacon. The project website (see below) has FAQs and information sheets offering responses to various concerns. For every point raised by opponents, Compliance offers a solution, a rebuttal or a commitment to study the issue further. And so on, point counter point, for each topic. Snyder, however, finds these responses insufficient. He and his colleagues are in dialogue with Compliance, but their hopes of stopping the mine are pinned on both the Federal and Provincial governments. To move forward, the project must successfully pass through complex environmental review processes both provincially and federally. In theory, either of these could stop the mine—although there is no precedent for this in BC, says DOC’s Willis. “They have never turned down a mine at the environmental review stage in BC,” she says. Still, she remains optimistic. “Ultimately, it will come down to the citizens; it’s so important for the citizens to be vigilant and to comment. The government needs to know we’re watching this; they need to know our concerns,” she says. Both the Federal and the BC environmental reviews include periods for public input. Willis and Snyder encourage people to express their concerns both in writing, which has a more formal impact, and by showing up and speaking at public meetings, which makes a bolder, more public statement. As the public review process gets underway, CoalWatch will provide guidance on its website for members of the public wanting to take part. The review process itself is controversial. CoalWatch and its allies are pressing to have the federal process upgraded from its current form (called a Comprehensive Federal Review) to a more stringent level, called the Full Expert Panel Review, which will include public hearings along with the opportunity to have scientists, mining engineers and other experts present their testimony. “This is the most exhaustive form of review and from our point of view this deserves nothing less because it is so far reaching in terms of who it affects and how it affects the environment,” says Snyder. As well, almost all the concerned parties are calling for thorough mapping of aquifers, and scientific studies of how they would be impacted by the mine. In the meantime, things are getting more complicated. Much to many people’s surprise, on July 19, the Federal Office of the Canadian Environmental Assessment Agency (CEAA) commenced a public comment period for the proposed mine, with no public notice other than a posting on the CEAA website. Within days Snyder had fired off a letter of protest to Federal Environment Minister Jim Prentice and spoken on CBC Radio’s On the Island, as well as local radio stations JET FM and The Eagle. Snyder’s got quite a long list of complaints about the timing of this process: he points out that the proposal for the mine is not even complete, that the key background document is not yet available, that the public can’t properly evaluate the project without aquifer mapping, that there has been no public advertising of the public comments period, and that the project warrants a Full Expert Review Panel. Annie Roy, CEAA spokesperson, speaking on CBC radio, said the 30-day limit for public comment will be measured from the day the full proposal and background document are posted on the CEAA website, but that no public advertising of this would take place. She did not comment on the other issues. In his letter, Snyder calls the CEAA to task, stating, “The surprise announcement on July 19 creates the impression that the federal government intends to pursue a hasty and far less rigorous assessment than the proposal warrants,” and he firmly but politely asks the Minister to “restore public confidence” by moving ahead with the Full Expert Panel Review and with aquifer mapping. This type of swift, decisive response suggests CoalWatch knows how to be a fierce opponent. He points out that local shellfish farming already provides twice as many jobs as the mine promises, and that these are connected to a sustainable industry which may be threatened by the mine. It’s a lot easier to preserve these jobs than to build a mine that would put them, and so much else, at risk, he says. Snyder may not have been an environmental activist this time last year, but he sure sounds like one now. Whether he and his many allies will actually stop the Raven Underground Coal Mine remains to be seen, but clearly, he’s not going to give up.